Welcome Running Titan Nation !!! SCHEDULE: Key - Events / info in grey, competitions in pink, practice in green (madatory), and meetings / activities in orange. Note: For track and field practice we will meet Outside. If it is below 40 degrees we will go outside. Mar 11 - On 3:45 PM HS / 4:30 PM MS Team Practice - Outside Practice will be outside from now on. If it is raining at 3:30 PM, HS will start inside in the back hall. If it is raining at 4:30, MS will start inside in the back hall. HS - meet at the finish line and put your bags along the fence. MS meet at the North end of the track 110H start area. Apr 26 3:45 No practice - High School or Middle School Workout on your own. May 7 4:45 PM Senior Night prior to the Rivalry Week Dual Meet Combined Shelby County HS and Collins HS Senior night. Please be ready to go at 4:30 P.
June 5-8 Maximum Velocity Track & Field Camp Track camp at Centre College coached by Olympians. For info go to MVTFA. There are scholarships available through the KTCCCA. The deadline is April 20. Click on KTCCCA MVTFA Scholarship. Documents - You can not practice with the team until you have submitted all of the required docs that are highlighted below in Yellow . Partial paperwork will not be accepted. PRINT OUT, COMPLETE AND TURN IN TO COACH SANDERLIN ASAP (By Dec 19 ) NOTE: You are NOT on the roster until you complete this and turn it in. HS AIFs go to Coach Sanderlin and MS AIFs go to Coach Rowe. Print, read and review. Both athletes (initial and sign) and parents must sign the last page and turn in on or before before you can attend official practice. 3 Athletic Participation Form and Physical (good for one year) MUST BE ON FILE WITH BEFORE YOU CAN ATTEND OFFICIAL PRACTICE. If you have completed one from another sport, let a coach know. 4 Drug Testing Procedures & Consent - High School Only! (good for school year 2018-19) MUST BE ON FILE BEFORE YOU CAN ATTEND OFFICIAL PRACTICE. Note: Middle school does not have to complete this form. Equipment List and Training Objectives (T & F) Print out, read, and put in your MLCHS Running Titan folder. Must bring water bottle, light / bright colored clothing (no dark pants and shirt), and running shoes to practice! Must be WORFY (White, Orange, Red, Flourescent, Yellow) compliant! 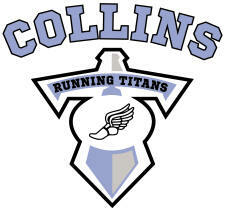 Track & Field Meet Schedule - Collins & West Print out and put in your Running Titan folder. Collins Varsity Letter Criteria Print out and put in your Running Titan folder. Training Log Log your workouts (type), mileage, sleep, what you eat, how you feel, etc. You can not improve what you don't measure! Parent Volunteer Application Parents must fill this out and submit it to the Powell Miller, Athletic Director or Leesa Stivers, Family Resources and Youth Services Coordinator, before they can volunteer for and event. It takes several weeks to process this, so don't delay. Parents must complete these and return to a Coach. Note: they must be notarized. Green form is for one-time pickup after a meet. (vs. riding the bus) There is an option for pickup after all meets. Yellow form is when you provide for transportation and SCPS does not (seldomly used). Pink form is when you provide for transportation to and from any meet(s) during the entire season (this is the most common and comprehensive form to use). Audrey Petty's Shutter Fly Site for MLCS / SWMS XC 2018. See pictures from all of the meets (HS & MS)!